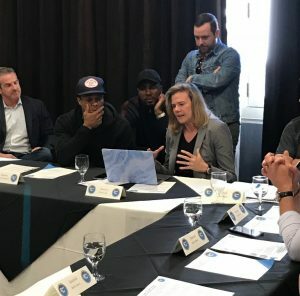 Last week during NBA All-Star festivities in Los Angeles, TPG Sports Group hosted NBA players, coaches, and executives, to discuss investments and sports technology. This private forum included presentations and discussions to enable athletes to be more informed when exploring investment opportunities. Steve Gera, chief executive, Gains Group, kicked things off with a detailed presentation on “What’s Next in the Sports Industry?” which included biodata and sleep technology. Vasu Kulkarni, partner, Courtside Ventures, led a discussion on investment opportunities in the sports and tech space. Kulkarni shared the exclusive opportunities that athletes have access to because of their influence and following. TPG was proud to have Andrew Menter, CEO, Physmodo and Kim Cook, CRO, Hookit, participating in the roundtable as well. Both companies were past participants of Sports Tank. Cook was able to show the players their “true value” to sponsors and more through Hookit’s deep data. This data can be used to increase sponsorship deals and compare performance to other athletes to gain a competitive advantage.